"I'm a yakuza from the old school. If I have to die, so be it." 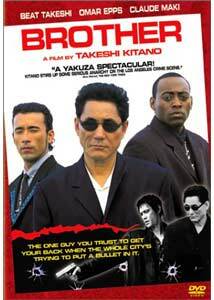 Takeshi Kitano's Brother (2000) shakes up the mob crime drama genre with a brutal and hard-hitting tale of a disenfranchised Japanese gangster and his assault on the territories of an array of violent Los Angeles drug traffickers. Kitano has dabbled in high body count crime sagas in the past, most notably Sonatine (1993), but with Brother he has elevated it to an art form, creating violence and beauty that at times echoes that of Martin Scorcese, yet here layered in the complex world of the Japanese yakuza. Kitano opens his story in Japan, where Yamamoto (Kitano, here billing himself as Beat Takeshi) , an explosive member of a Japanese crime family, is exiled when he is no longer needed after assassinations render the power structure unstable. Traveling alone to the United States, Yamamoto ends up in Los Angeles to seek out his younger half-brother Ken (Claude Maki), a two-bit drug dealer. When Ken and his crew are threatened by the strong-arm tactics of the local drug kingpin, Yamamoto unleashes a bloody attack that serves to be the first step in the creation of a deadly new crime family, led by Ken, Denny (Omar Epps), and of course Yamamoto. As their drug empire grows exponentially, and their competition is slowly destroyed, Kitano builds Brother to an inevitable cataclysmic confrontation with the Italian mob. To call this a 'gangster film' would be far too simplistic. Kitano not only immerses the viewer in the intense honor and rituals of the Japanese yakuza, but he also merges it with the comparatively undisciplined Western crime world. His script, while basic at its most rudimentary level, is richly layered, and features a wide range of violent criminals and their complex inner-workings amidst the rise of a new crime empire. Some of the Japanese characters speak their native language, requiring the disc's English subtitles, while others speak English, and this added level of realism seems completely natural. Some of the character alliances are sometimes confusing, but I found that element to only add to the realism as Kitano reveals the dynamic crime world. The unflinching violence is ongoing, with bodies stacking up like cordwood, but Kitano's vision of the ruthless Yamamoto's honor is revealed to be more than simple bloodlust. As Yamamoto, Kitano portrays him as a silent killer, one who can explode into rage at a moments notice. With his dark sunglasses and ever-present black suit, Yamamoto is virtually expressionless throughout Brother, except for an occasional subtle facial twitch. Whether he is innocently cheating at a dice game or mercilessly blowing away his enemies, he carries the same cold, stoic look that exudes a killer's raw confidence. Admittedly there isn't much depth to his acting, but Kitano's charismatic presence gives the role life. As a director, Kitano's skill as a visual stylist gives Brother a unique look that is sadly missing from lesser crime sagas, and reinforces the inevitable comparisons to Scorcese. While the bloodshed here is extensive, the way Kitano presents it is often lyrical. Unlike John Woo, whose gangster classics feature elaborately choreographed gun battles, Kitano doesn't dress up the killings with flashy pyrotechnics, but rather chooses to stage them with often startling frankness that is rather jarring. He frames a number of shootouts from a distance, allowing the muzzle flashes to illuminate the action. As Yamamoto's crime syndicate grows, and their surroundings become more lush, the constant barrage of death is all the more stylistically dramatic. My only beef, as with most films concerning the mob, is the complete absence of any police presence. Kitano makes a quick reference to some paid-off cops, but overall the grand displays of violence, often in broad daylight, are never hampered by police, or bystanders, for that matter. Image Transfer Review: A very nice 1.85:1 anamorphic widescreen transfer from Columbia TriStar on this one. A purposely pale color field gives Kitano's film an effectively distant and antiseptic look. Colors tend to be primarily blacks, whites and grey, with a veneer of icy blue. Black levels are fairly solid, with strong shadow depth. The image transfer is free of any glaring nicks or scratches, and has some minor compression issues, though not significant to the point of distraction. Audio Transfer Review: Brother's audio transfer features a pair of mixes, in 2-channel surround and 5.1 Dolby Digital. The tracks feature both extensive English and Japanese dialogue, so the use of the available English subtitles is required. Dialogue is mixed clean and clear across the front channels, layered with some solid spatial imaging. The use of the rear channels on the 5.1 track are well done, with a strong directional soundscape. Such varied effects as guns firing, off camera voices and doors slamming are used prominently as rear channel cues, and give the disc a pretty impressive, encompassing surround experience. The 2-channel track lacks some of the discrete surround capabilities that the 5.1 track offers, and as such, has a noticeably weaker presentation. Extras Review: Three trailers (Love and a Bullet, Gen-X Cops, Time and Tide) are the only supplementals here, other than the required subtitles (English, Spanish and French) and 28 chapter stops. Kitano's film is a bloody and violent hard-boiled crime epic, one that moves relentlessly across the L.A. underworld. If you are a Scorcese fan, then I suggest you owe it to yourself to take a look at Brother.